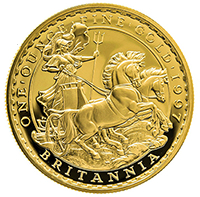 The Britannia is one of the most recognisable coins in the world today, made in both gold and silver by the Royal Mint at their refinery in Llantrisant, South Wales where the Mint has been operating since the early 1970s. 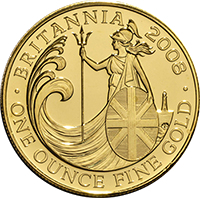 The first gold Britannia was made in 1987 and has been produced annually for the last 31 years. The silver Britannia was a more recent addition to the Royal Mint’s range. 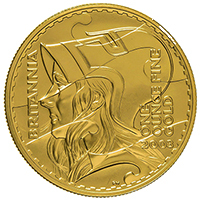 Special anniversary proof editions were released in 1997 to mark the 10-year anniversary and bullion versions were released since 1998. Upon release the gold Britannia, like the older gold Sovereigns, was a 22-carat coin. This continued to be the case until 2013, when the Royal Mint changed their policy and increased the coin’s purity to 24-carats; a step up from the gold Krugerrand to rival productions by the US and Canadian Mints. Silver experienced a similar change, forced by competition from foreign mints. Initially, silver Britannia coins were minted at 958 fineness but in 2013 these coins changed to become 999.0 fine silver. 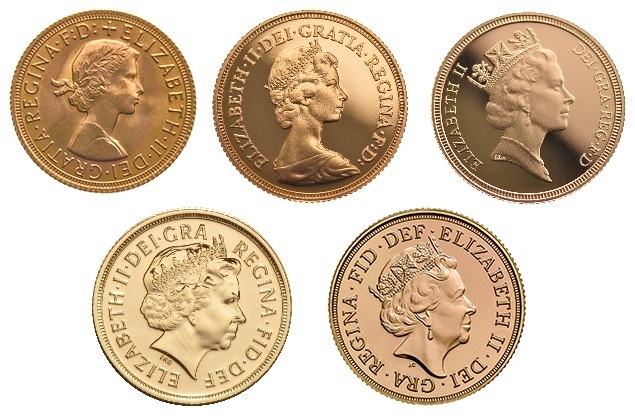 There have been five portraits of the Queen used on British coins since Queen Elizabeth II's coronation. The Young and Jubilee heads can be seen top left and top centre in the above image. The first gold Britannias from 1987 to 1997 featured the third portrait of the Queen, as designed by Raphael Maklouf (top right). Sculptor Ian Rank-Broadley won the Royal Mint’s contest to design the next portrait, and his designs were used from 1998 until 2015 (bottom left). Many commonwealth nations still use this portrait as the obverse for their coins today, most notably the Perth Mint in Australia. Since 2015 the Royal Mint has used the fifth and likely final portrait of Queen Elizabeth (bottom right), as designed by their very own Jody Clark – the first Royal Mint employee to ever design the Queen’s portrait. 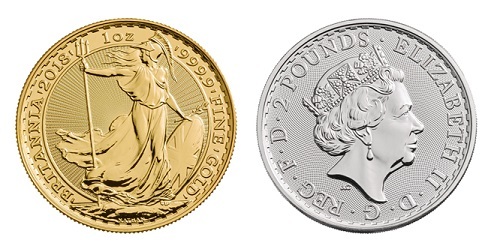 At present both the gold and silver Britannia coins feature a standing figure of the lady Britannia. This was designed by the artist and sculptor Philip Nathan and is derived from that of the Florins coin, better known as a Two Shillings. 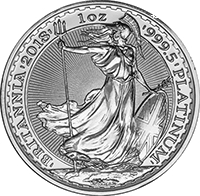 Nathan’s coin design features Britannia looking to her left with the wind blowing her hair. In her right hand is a trident, and in her left is an olive branch clasped alongside a shield bearing the Union Flag. The artist’s signature is present at the base of the coin. The design ran consecutively from 1987 to 1996, though a special edition was used in 1997 to mark the 10-year anniversary. It continued between 1998 and 2000 though other designs were introduced between 2001 and 2013, as listed below. complete with trident and shield. designs were used for proof coins, as listed below. To view specific year gold Britannias, click here. To view our range of 1oz silver Britannias, click here. For smaller size Britannia coins (1/2oz, 1/4oz, and 1/10oz), click here. Queen, Boudicca (Boadicea). This coin was also designed by Philip Nathan. design was later re-used in 2009. 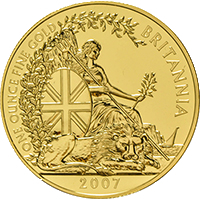 To view the 2009 gold Britannia coin, click here. Queen Victoria’s ‘Una and The Lion’. in her right hand behind her, and Nathan’s signature is beneath the lion’s mane. To see our 2001 gold Britannia coin, please click here. tessellated effect makes the coin look like a jigsaw and the waves stand out more notably. 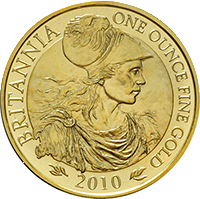 The image is a side-facing portrait of Britannia, looking to the left of the coin while wearing a helmet. To view our range of 2003 Britannia coins and sets, please click here. This was the last variation designed by Philip Nathan. To view various 2005 Britannia coins and sets, click here. Union Flag shield sits at her side and she plays with what looks like an olive branch. To view the 2007 Britannia four-coin proof set, click here. To view other 2007 Britannia coins, please click here. hand, shield in the other. To view the tenth, quarter, half and full ounce 2008 Britannia proof coins, click here. To view our 2008 Proof Britannia gold four-coin boxed set, please click here. twentieth century French gold coins. 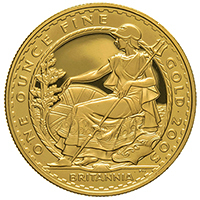 Click here to view the 2010 one ounce Britannia gold coin. For the 2010 four coin proof Britannia set, click here. Britain; a Britain which is culturally on the move but still with plenty of reasons to wave the flag. 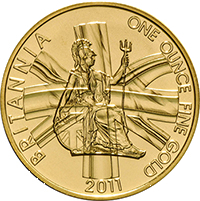 To view the 2011 1oz gold Britannia, click here. To see our 2011 three-coin proof gold Britannia coin set, click here. with the launch of the new, higher purity coins. Flag shield has disappeared, but instead an owl – a symbol of wisdom – sits on Britannia’s knee. 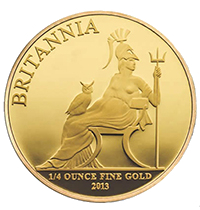 To view the 2013 1oz gold Britannia bullion coin, click here. 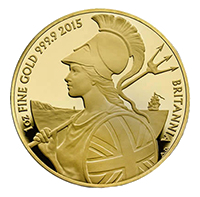 For the five-coin gold Britannia proof collection, click here. 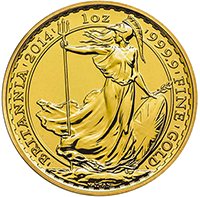 Click here to view the 2014 one ounce bullion Britannia gold coin. For the 2014 proof Britannia six-coin set, click here. Margaret Thatcher that currently resides in the Members’ Lobby of the Houses of Parliament. at the lady once again. The shield has returned to her left side, while the trident rests on her right shoulder. while a ship sails inland. 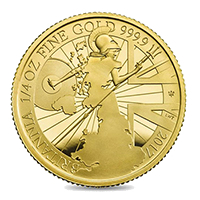 Click here for the 2015 bullion gold Britannia. – and features a more traditional Britannia stood poised with shield and trident. 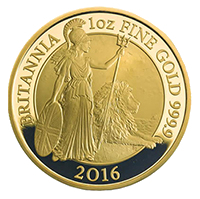 Click here for the 2016 Britannia gold bullion coin. out of the United Kingdom but results in a very busy coin design. of the coin – with LWT engraved in the middle to indicate Tamlyn’s work. To view the 2017 anniversary edition silver bullion Britannia, click here. For the proof 1/4oz gold Britannia coin complete with box & certificate, click here. 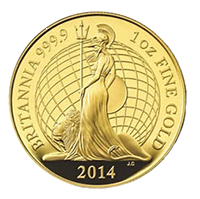 Only 7,030 gold bullion Britannias and 120,000 silver bullion Britannias were minted with the trident privy mark. 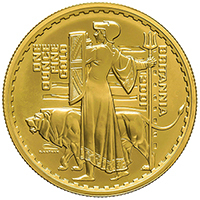 For the 2017 uncirculated 30th anniversary gold Britannia, please click here. features the guilloche pattern and is a 1oz coin. Click here for the 2019 Gold Britannia, Silver Britannia, and Platinum Britannias. The pattern was inspired by the Chinese rooms at Buckingham Palace and the Royal Pavilion in Brighton. Production is limited to 5,000 gold Oriental Britannias and 100,000 silver Oriental Britannias. Click here for the 2018 Gold Britannia (Oriental Border) or here for the 2018 Silver Britannia (Oriental Border). work, Lawrence was commissioned by the Royal Mint to produce a new proof-only take on the lady Britannia. English rose, Welsh daffodil, Irish clover and Scottish thistle as a subtle nod to the union of the United Kingdom. This coin is produced to .999 purity in silver and .9999 in gold. 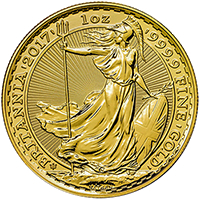 Click here for the 2018 Gold Britannia bullion coin, the 2018 Silver Britannia bullion coin, or the 2018 Platinum Britannia bullion coin. surrealist David Lawrence to reimagine Britannia for their newest proof coins. the trident and shield which are so often depicted as part of her legend. Following the success of last year's limited mintage of Britannia coins with an oriental-style border, the Royal Mint has issued another set of gold and silver 1oz bullion coins for investors and collectors alike. Click here for the 2019 Gold Britannia (Oriental Border) or here for the 2019 Silver Britannia (Oriental Border).